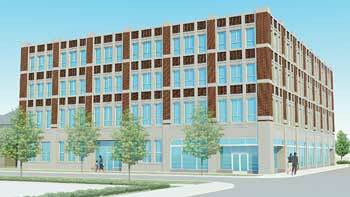 A rendering of the proposed building at 820 Madison St., formerly occupied by Comcast and before that a Cadillac dealership, illustrates how the façade will be restored and two floors added to accommodate affordable housing. 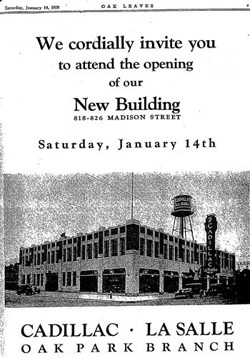 In 1927, well known Detroit architect Albert Kahn designed and built the two-story Cadillac showroom and maintenance garage at 820 Madison Street in Oak Park. Kahn is internationally known for his industrial architecture, much of it auto-related and for a number of structures at the University of Michigan. This substantial concrete framed building with limestone and brick façade is a unique example of the master architect. In 1981, Comcast purchased the building and modernized the façade by covering the rich textured design with Drivit or synthetic stucco. Fortunately, the structure was built so solidly that the original masonry and concrete was retained and simply concealed, resulting in a ghastly lifeless façade. Enter Dennis Langley, Oak Park architect and expert in affordable housing retained by Interfaith Housing Development Corporation. His firm Weese Langley Weese Architects has its roots with the famous Harry Weese Associates, the architect for our Village Hall. The program proposal is to convert this commercial property into mixed-use affordable housing and retail space by removing the Drivit cladding, restoring the façade and adding two floors to match the original design. The development plan includes incorporating green elements to create a responsible LEED certified building. Foremost in sustainability, is the plan to retain and repurpose the building. The technology includes a geo-thermal park of 21 wells drilled 650-feet deep to tap the earth’s natural resources, providing 100 percent heating and cooling. The landscaped ‘park’ on the north side would provide a green relief between the buildings, respecting the adjacent single-family residence. The interior would be protected by high energy performance insulation, recycled content materials, and fluorescent lighting. This is no small task for such a noble cause. The adaptive re-use project proposes to provide 51 clean, safe and affordable one-bedroom apartments with social services for the working poor at a location that is rich with public transportation. Few of the residents will have cars, relying on walking, biking and public transit. Facing Madison on the first floor, the team has proposed 5,233 square feet of retail space to reinforce the adjacent commercial use. The entrance to the building will be on the Grove Avenue elevation leading to an elevator, offices, a community room, toilets and storage. Langley and the development team have devised a handsome solution to this very complex project. Taking the cue from the Kahn design, the two story L-shaped addition will match the historic rugged and textured façade. Some selective demolition on the west side has been completed, exposing the interesting detailed façade for all that would like to see. The Historic Preservation Commission has carefully reviewed the project and given their unanimous support for the appropriateness of the design, height allowance and preservation plan. Interfaith Housing has been meeting with Oak Park citizens, organizations, neighbors, and village officials for over two years to solicit their input. Thirty one meetings and tours of similar projects have been made by Interfaith to display to the neighbors the quality of the facility they wish to successfully develop. The design of the facility would expand the diversity of housing stock and support racial integration, which are both consistent with the Village Comprehensive Plan Objectives. The targeted tenant would be single, working (income less than $26,000/year) and currently employed or living in Oak Park. Paul Vietti of Interfaith, who lives two blocks away, predicts that, "This would be a very desirable place to live, resulting in 90 percent residing for multiple years." The Oak Park Housing Authority currently has a waiting list of 200 people who would be qualified for this facility. This is a wonderful humanitarian project. We have a talented architect, a unique historic building, a strong development and management team and another opportunity to build on the success of the new Walgreen’s located across the street.